Scientists have identified major molecular differences between a GMO corn and its non-GMO parent. A unique new study published on December 19 in the scientific journal Nature has used molecular profiles to reveal major differences in composition between a GMO corn and its non-GMO parent. These findings question industry and regulatory position of “substantial equivalence” and have serious safety implications. The new peer-reviewed study led by Dr. Michael Antoniou at King’s College London describes the effects of the process of genetic engineering on the composition of a genetically modified Roundup-resistant GMO corn variety, NK603. In-depth analysis of types of proteins (“proteomics”) and small biochemical molecules (“metabolomics”) revealed major compositional differences between NK603 and its non-GMO parent. The results obtained show not only disturbances in energy utilisation and oxidative stress (damage to cells and tissues by reactive oxygen), but worryingly large increases in certain substances (polyamines). The establishment of compositional ‘substantial equivalence’ is a key starting point requested by regulatory agencies for assessing the safety of a GMO crop and food. If analysis for nutrients and known toxins shows that the composition of a GMO crop is found to be in a similar range to that present in a corresponding, genetically similar non-GMO variety (often the non-GMO parent), then it is deemed to be ‘substantially equivalent’ and to require little, if any, further safety testing, especially in the USA. Genetically modified (GM) corn NK603, engineered to survive being sprayed with glyphosate based weedkillers such as Roundup, was assessed as ‘substantially equivalent’ to its non-GM parent corn variety, based on a nutrient composition analysis of both crops. It was subsequently granted market approval. However, the nutrient compositional analysis is relatively crude and may miss subtle yet important differences between the GMO and non-GMO food, which could have health consequences for the consumer. For example, the compositional analysis includes measurement of total protein content, yet this is less important than the profile of different types of proteins. In other words, the message is in the detail, yet this detail is currently lacking in regulatory analysis investigating the substantial equivalence of a product. This gap in compositional information for the Roundup-tolerant NK603 corn was addressed in this study by analysing this GMO with the nearest non-GMO corn variety as a control. The two crops were grown under similar conditions, in the same location and season, spaced at a sufficient distance to avoid cross-contamination. One field of NK603 was sprayed once with Roundup, whilst another field of NK603 was not treated with Roundup. Samples were produced in two cultivation cycles over two growing seasons. Thus all precautions were taken to minimise environmental factors that could influence the composition of the crops. The result is a comparative analysis that specifically highlights the effect of the genetic modification (GM) transformation process. Rats fed this GMO corn over 2 years presented signs of a higher incidence of liver and kidney damage (Séralini et al., Environmental Sciences Europe, 26:14)compared with controls. Analytical methods collectively known as “omics” technologies can be used to obtain an in-depth, molecular composition profile of a biological system/substance. These technologies include transcriptomics (gene function profile), proteomics(protein type profile) and metabolomics (small biochemical metabolite profile). Unlike gross nutrient analysis, omics technologies provide highly detailed molecular composition and biological functional information with a very high degree of predictability of health or disease status. This broad range of analysis is designed to ascertain more deeply and precisely whether NK603 is truly ‘substantially equivalent’ to its corresponding non-GMO variety and whether this raises any health concerns. State-of-the-art molecular profiling ‘omics’ methods could be used to deepen our understanding of the differences between GM plants and their non-GMO counterparts. This would enable scientists to improve the pre-commercial safety testing of GM plants by highlighting the presence of increased levels of known toxins (for example, certain polyamines found at increased levels in this study) or novel toxins and potentially allergenic substances. 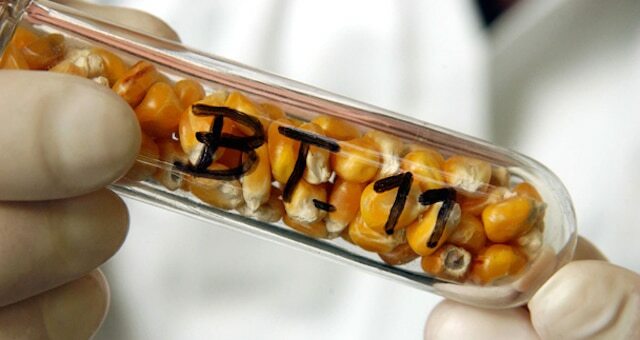 Genetically modified maize is a genetically modified crop. Specific maize strains have been genetically engineered to express agriculturally-desirable traits, including resistance to pests and to herbicides. Genetically modified crops (GMCs, GM crops, or biotech crops) are plants used in agriculture, the DNA of which has been modified using genetic engineering techniques. In most cases, the aim is to introduce a new trait to the plant which does not occur naturally in the species. Examples in food crops include resistance to certain pests, diseases, or environmental conditions, reduction of spoilage, or resistance to chemical treatments (e.g. resistance to a herbicide), or improving the nutrient profile of the crop. Examples in non-food crops include production of pharmaceutical agents, biofuels, and other industrially useful goods, as well as for bioremediation. Farmers have widely adopted GM technology. Between 1996 and 2015, the total surface area of land cultivated with GM crops increased by a factor of 100, from 17,000 km2 (4.2 million acres) to 1,797,000 km2 (444 million acres). 10% of the world’s arable land was planted with GM crops in 2010. In the US, by 2014, 94% of the planted area of soybeans, 96% of cotton and 93% of corn were genetically modified varieties. Use of GM crops expanded rapidly in developing countries, with about 18 million farmers growing 54% of worldwide GM crops by 2013. A 2014 meta-analysis concluded that GM technology adoption had reduced chemical pesticide use by 37%, increased crop yields by 22%, and increased farmer profits by 68%. This reduction in pesticide use has been ecologically beneficial, but benefits may be reduced by overuse. Yield gains and pesticide reductions are larger for insect-resistant crops than for herbicide-tolerant crops. Yield and profit gains are higher in developing countries than in developed countries. However, opponents have objected to GM crops on several grounds, including environmental concerns, whether food produced from GM crops is safe, whether GM crops are needed to address the world’s food needs, and concerns raised by the fact these organisms are subject to intellectual property law.